With what started as a request from Fred Kohl, a life-time Vandalia resident, to the Vandalia Board of Aldermen in the early 2000s the Eastern Missouri Family YMCA in Vandalia opened its doors on Monday, Feb. 11. 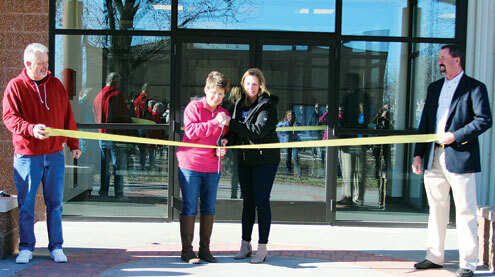 The opening was kicked off on Friday, Feb. 8 with a champagne toast at 7 p.m., in the new facility. Approximately 170 YMCA donors attended and were invited to tour the YMCA following cupcakes and punch being served. The $1.8 million spent on the new YMCA is an investment into the community, Winders added. Jamie Franke, minister of the First Christian Church in Vandalia offered the invocation for the evening. Winders went on to tell of following Kohl’s suggestion for a YMCA that former mayor, Ramon Barnes, spoke with Sherry Medley, Mexico YMCA director at the time. Following that meeting Winders met with Roger Young, Rual Morris Foundation board member, to discuss who would be a good candidate to spearhead the idea and fund-raising efforts. Young approached Felicity Goodpasture-Culwell, she accepted the challenge with true passion and hit the floor running. Those who have toured and worked out at the Y have seen the Felicity Goodpasture-Culwell Gymnasium which was named in her honor following her sudden death in December 2017. Next to the podium was Lori Brandow, executive director of the Mexico YMCA who told the crowd she was a bit scared in the beginning but then she visualized what it would do for Vandalia and the surrounding area. Brandow announced that following a membership drive in January the board was pleased to announce they are half way to the goal before the doors were open. Lots of challenges were thrown out and the volunteers kept going with all their hearts. Steve Hobbs on behalf of Jeanie Riddle and Kent Haden, remarked that something needed to be done differently to get kids back in the community and to sustain and foster the quality of life in Vandalia. She thanked them for not giving up and doing what was right. She recognized the Rual Morris Foundation for its donation and Max Kennen who has pledged an endowment to the facility. With that Hopke raised her champagne glass high and toasted the opening and future success of the Eastern Missouri Family YMCA! The Vandalia Area Chamber of Commerce held a ribbon-cutting on Saturday, Feb. 9 at 10 a.m.
Chamber representative Ramsey Woodall Dickerman welcomed those attending and wished the best of luck to the Eastern Missouri Family YMCA. Director Hopke then cut the ribbon to officially open the Y for tours. The open house was held from 10 a.m.-noon with approximately 180 attending.